There has been much written of late about the tremendous potential of additive manufacturing, which may radically alter the manufacturing landscape over the coming decades. While traditional manufacturing via subtractive processes depend upon the removal of material by methods such as cutting and drilling, additive manufacturing utilizes techniques such as 3D printing to create objects by laying down successive layers of material. Many hobbyists and home enthusiasts have been happily getting into the act with increasingly inexpensive 3D printers from companies such as Makerbot which use plastic that is heated and rendered into any number of shapes and products. 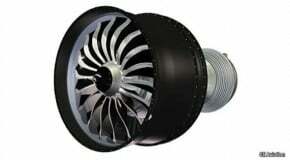 However, additive manufacturing is increasingly finding its way into commercial applications too. What does this mean for you? Well, one of the ramifications of additive manufacturing is that you can look forward to flying in the near future with the help of a jet engine made of components that were printed by an MEP client! Morris Technologies and its sister company, Rapid Quality Manufacturing, are precision manufacturing firms that are based in Evendale, Ohio, a suburb of Cincinnati. According to their Web site, Morris Technologies has “pioneered the use of direct metal laser sintering (DMLS) to produce fully functional, complex metal parts straight from 3D CAD models.” Laser sintering is one of many additive manufacturing techniques used to produce parts (for more information on the various techniques, check out one of my prior blogs here), and offers the ability to heat powdered metals to create a wide range of parts, including components made from Ti64. This aerospace-grade titanium offers high mechanical properties, corrosion resistance, and low weight, and also lends itself to biomedical applications such as implants thanks to its biocompatibility. Last week, GE Aviation acquired these two small manufacturers, which together employ about 130 in the Cincinnati area. GE expects to utilize their capacity to print components for the LEAP jet engine, which is slated to go into service in the next few years for short-haul airline use. In fact, over 4,000 of these engines, a joint venture between GE Aviation and Snecma of France, have already been ordered. What does this have to do with MEP? Well, Morris Technologies is one of many Ohio small manufacturers that have been served by TechSolve, part of Ohio MEP. Among other things, TechSolve has assisted Morris Technologies with a test plan for safe grinding guidelines and parameters for the super-finished cutting edge inserts to apply to titanium alloy parts that laser sintering techniques print. In other words, TechSolve has helped Morris with the process to finish the aerospace-grade titanium that is being printed via additive manufacturing, as such alloys are inherently difficult to machine.